Did you ever ask yourself, "Exactly what is chutney?" While almost everyone has had this condiment at least once, many people have no idea what constitutes chutney or with what cuisine it is associated. Chutney comes from the Indian word chatni, a word that is thought to mean crushed. It is a relish that is made of a variety of fruits, spices, and other ingredients and served with curry dishes in India. Originally, the ingredients were ground to a paste with a mortar and pestle. The chutney was normally eaten freshly made, so it did not need to have the addition of vinegar or citrus for preservation. Now chutney can be made in a blender, and it is often preserved with vinegar. During the British colonial era, British soldiers learned to enjoy chutney. When they left India for England they took it with them. As the men and their families journeyed to other outposts in South Africa and the Caribbean, chutney made its way to these cultures, as well. Each culture used fruit that was available to them, so the variety of chutneys increased. Chutney is now used for everything from dips to desserts. What Is Chutney Made Of? Chutney can be sweet, hot, or a combination of the two depending on the ingredients used. Commercially prepared, Americanized chutney is normally sweet. Chutney is used as a condiment in a way that is similar to relish or salsa. It is usually an accompaniment to curry dishes and meats. 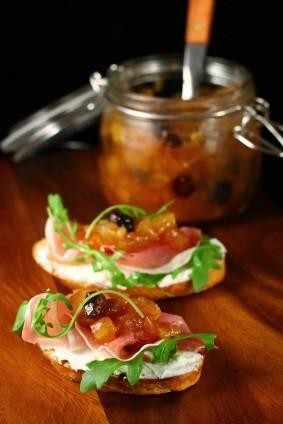 Since it has become more available, chutney is also being used in a variety of appetizers and as a snack with crackers. Use spicy-sweet chutney over cream cheese as a spread for crackers. Sweet chutney goes well with ham and other smoked meats. Use all types of chutney with curry dishes. When chutney is mixed with mayonnaise, it makes an excellent spread for ham, turkey, or chicken sandwiches. Chutney gives a Waldorf salad a unique twist. Add chutney to your favorite chicken salad. Add chutney to your basic vinaigrette salad dressing. Add a spoonful to a baked sweet potato with or without butter. Add chutney to steamed carrots. Add a spoonful on top of grilled chicken. Now that you understand how chutney is made and what it is made of, you may be interested in making your own chutney or chutney dishes. Here are some recipes to get you started with this amazing condiment. What is chutney? As you can see chutney is a versatile condiment that can add an exotic touch to almost any dish. You can find it in the condiment aisle of most grocery stores, Asain markets, and on the Internet.